On an expressivist view, ethical claims are understood as expressions of our attitudes, desires, and feelings. A famous puzzle for this view concerns the use of logic in ethical reasoning, and two standard treatments try to solve the puzzle by explaining logical inconsistency in terms of conflicting attitudes. 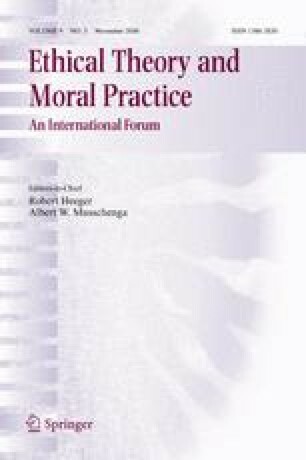 I argue, however, that this general strategy fails: because we can reason effectively even in the presence of conflicting moral attitudes – in cases of moral dilemmas – avoiding these conflicts cannot be a ground for correct moral reasoning. The result is a dilemma for expressivists: if they take all kinds of attitudes to be under consideration, then conflict cannot play the required role, since attitudes can fail to be compatible in cases of moral conflict. If they restrict attention to ‘all-in attitudes’ or to intentions or plans, then there is an important notion of obligation, used in standard arguments – one for which conflicts are allowed – that they fail to capture. I explain why expressivists should be especially tolerant of conflicting attitudes, and I conclude that they should pursue a different strategy for grounding logical normativity. McConnell (2002) Terrance “Moral Dilemmas”. In: Zalta EN (ed) The Stanford encyclopedia of philosophy (summer 2002 edition), URL =<http://plato.stanford.edu/archives/sum2002/entries/moral-dilemmas/>.